We carry an extensive inventory of aftermarket replica wheels at very affordable prices. Choose your car make, then choose your favourite model available for your car. Our Latest Alloy Wheels For BMW & Mercedes Benz. Also wide selection of brand name, or replica alloy wheels available for Porsche, MINI in many different size and color combination. All of our tires are available, boxed as well as installed. Or for the do it yourselfer, you can pick them up or have them delivered to your door by UPS. The buyer pays the actual shipping cost. Also, all of our tires are available in complete (rim + tire) balanced sets for your convenience. New high tech computerized laser guided diagnostic wheel balancer. Space age technology for space age cars. This wheel balancer has laser-guided operation for single spin Tape-A-Weight balancing with an increased line of site. It simultaneously displays static and dynamic data to identify excess residual static imbalance. Three active lasers scan rim, tire at all angles to provide diagnostic scan of entire package. It automatically suggest rim and tire matching. Rim and tire matching is when the lowest point of the rim meets with the lowest pint of the tire which in turn could give you vibration free selective speeds. 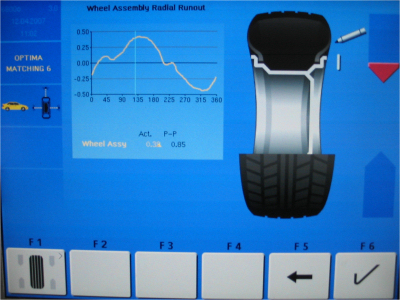 Laser Guided Operation eliminates error, caused by technician, by displaying exact Tape-A-Weight placement and behind the spoke weight placement locations. Behind the spoke weight placement helps maintain a "clean" look on custom wheels. 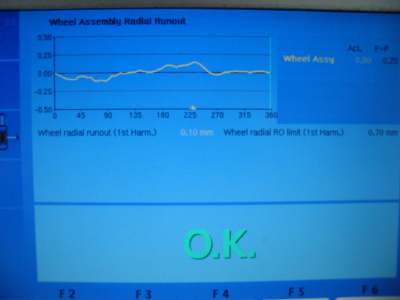 Also it checks rim and tire for any kind of rim and tire flaws, which could cause vibrations of highway speed. Does all this without dismounting of the trim and tire. Is your wheel balancer does this? Active laser scans the rim and the on board computer analyze the data. At next - the left picture is the display of a good rim. The right picture is the display of a rim, that need to be replaced. Advanced design technology and superior engineering are the reasons why Yokohama steel-belted radials are so frequently chosen for tough situations. Yokohama’s goal is to produce tires that are the most trouble-free with the lowest cost-per-mile when compared with any other tire in the industry. For example Yokohama tires like ADVAN sport, ADVAN S4, AVANES 100, ADVAN ST, and PARADA SPEC X for performance SUV's. Also a great choice the GEOLANDER HIT-S.
We also sell Continental, Dunlop, Pirelli, Michellin and Bridgestone tires as well. Please not we are not a tire dealer at foremost but, we know our stuff. Our prices on tires are competitive. We provide you with years of hands on experience and knowledge to choose the right tire for your automobile. We provide you with exceptional service, which may cost you few extra dollars more, than at mass merchants. We do not buy our tires at truck loads and try to sell them to you at discounted price just to move them from the warehouse to recoup the money invested. Instead we pick and choose tire with you, assisting you all the way to choose the best, that is match with your car and your driving style. Remember you will have to drive those chosen tires for considerable time after the purchase. Drive a fine automobile on a noise rough tires ruins the whole experience.